By now you are, hopefully, aware that I am of German background. Living in Canada can be a challenge sometimes, especially when it comes to cooking and baking. On the other hand, it is nice to see that you can surprise people with things that you are natural to you, like certain dishes. The past weeks I have become a part of a German-Canadian Baking and Cooking Club and as such I am preparing for a baking class. The club is called Kochlöffel und Nudelholz: German-Canadian Koch- und Backstudio and they have cooking as well as baking classes. If you are from Saskatoon and you are interested, let me know. So,the challenge: bake a cake or torte in 3 hours where participants have hands on experience. So, I was browsing my cook books and came across this recipe. 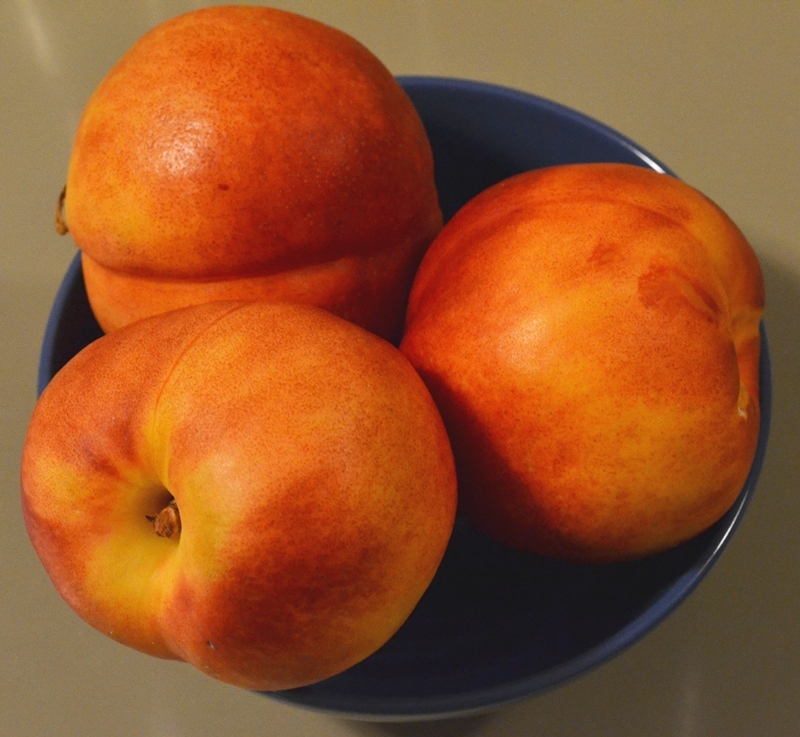 Lucky me, I had some nectarines in my fridge that needed to be used asap. Separate the eggs and mix the egg yolk with the warm water and half of the sugar. Set aside and mix the egg whites with the rest of the sugar until stiff peaks form. Set aside and mix flour, ground almond, salt and spices in a separate bowl. Then mix 1/3 of the beaten white eggs under the egg yolk mixture. Then, alternately, mix the rest of the beaten egg whites and the flour under the egg yolks. The batter should be fluffy. Line a spring form (24 cm diameter) with baking paper and grease the edges. Then fill the form with the batter and set aside. Core and peal the peaches and slice in thin wedges. Place them on top of the batter, slightly pressing in. Then bake the cake at 180°C for 40 to 50 min. Check the cake with a skewer; if it comes out clean it should be done. Make sure the top is not too dark. Remove from the oven and poke with a fork several time, then brush with the liquor. Let the cake cool on a rack and remove from the spring form. When it is fully cooled, remove the baking paper and place on a platter. Dust with icing sugar before serving. 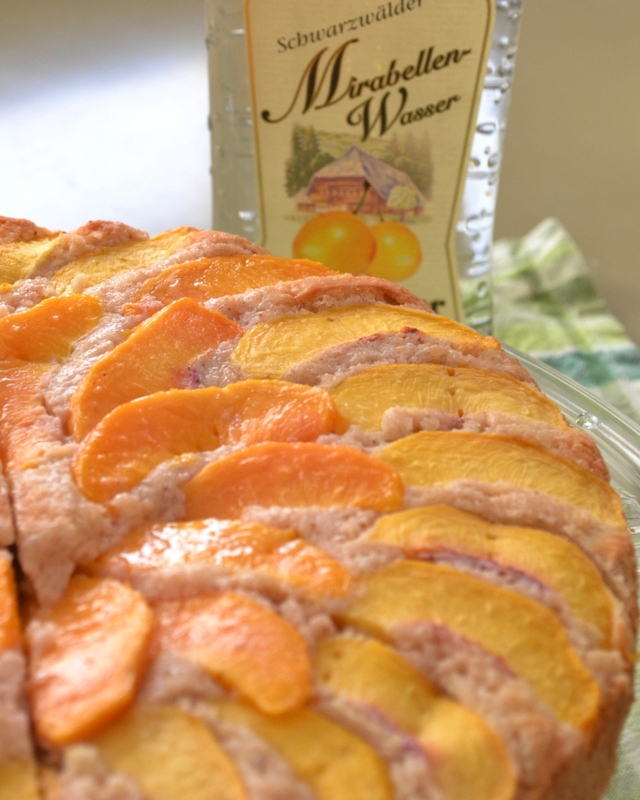 Total time for this cake is 85 to 95 min, including preparation, mixing, pealing fruit, and baking. That’s not all to bad for a 3 hour class. However, I think I will try another cake before finally deciding. The results of my other attempt will be posted here for sure. My co-instructor liked the cake though she said it slightly tasted like Christmas, which is true because there is cinnamon and gloves combined with almonds in the cake. One of my co-workers enjoyed it too. 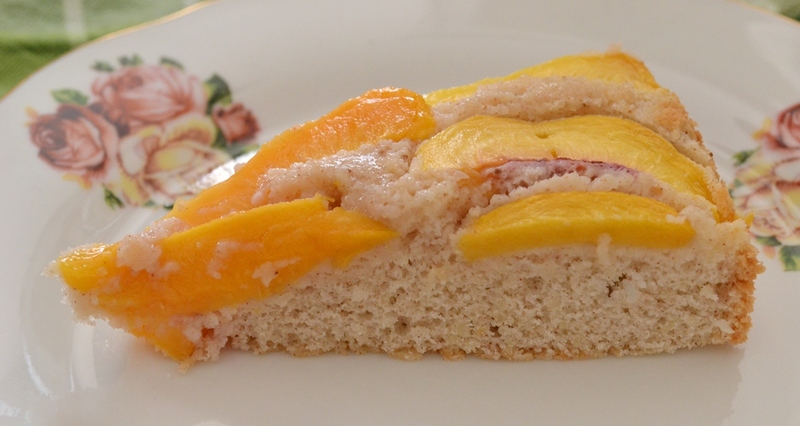 He’s Canadian, learning German, and never had fruit baked in a cake before. That’s what I really enjoy when baking here. You are showing people some new stuff that is absolutely normal to you. I am not assuming that he will start baking any time soon, but maybe he will look our for cakes like these. 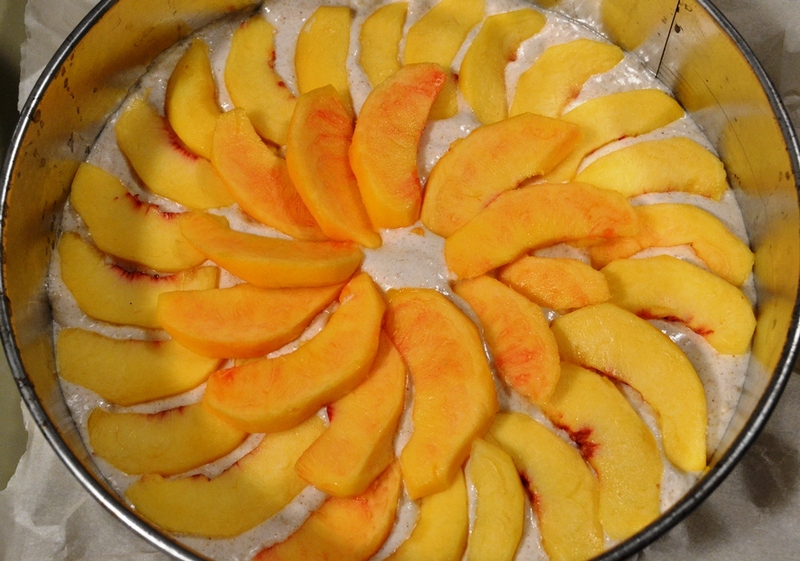 Posted in Cake and tagged baking, biscuit, cake, cinnamon, dessert, nectarine, recipe. Bookmark the permalink. 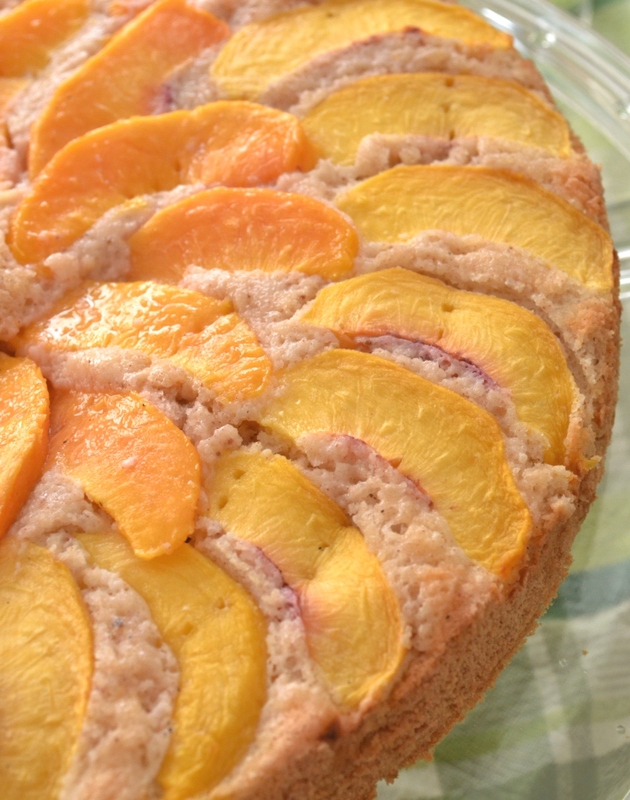 Sounds like a lovely cake – sort of like an upside down cake, which are immensely popular in North America. I especially like the first photo – makes me want to grab a slice! Love your photos and the cake looks divine!! Mmm I just baked with nectarines too 🙂 This looks amazing!